Back in 1989, a group of Seattle-based vintage car lovers decided to put on an event to showcase their cars. Pretty soon, someone said, “Let’s race!” The Pacific Northwest Historics was born. It’s a one-of-a-kind in this area event showcasing vintage racing in the Pacific Northwest. As part of the Sovren Vintage Racing circuit, this show offers three days of exciting racing alongside tons of vendors, lovers of old cars, and the smell of burning rubber and exhaust. Over 200 cars are expected to be on hand for this combination race weekend/celebration of classic cars. This year’s event takes place June 29-July 1 at Pacific Raceway in Kent, Washington, and includes a salmon barbecue on Saturday, June 30. Sovren Vintage Racing events generally include a theme, and this year’s Pacific Northwest Historics get-together has a good one. They are saluting Porsche on its 120th Anniversary, and Porsche racing on its 70th Anniversary. Porsche racing great George Follmer will be the featured guest. As far as the actual racing is concerned, the action will be fast and furious! The cars are separated into groupings designed to maximize competitive racing. What kinds of cars will you see circling the Pacific Raceway track? We’re glad you asked. Results from last year’s races include Group One’s Andrea Hart, piloting her 1963 MGB to victory. Charlie Mitchell drove his 1969 Triumph TR6 to the winner’s circle in Group Two. Del Mackenzie’s 1965 Ford Mustang crossed the finish line ahead of everyone else in Group 3. (Mustangs have a habit of doing that.) Group Four saw an exciting finish with Chris Schoap’s 1970 Titan Mark VI outpointing Jeff Kemey in his ’68 Lynx. The Group Five winner was the flying #3 car. It was a Caterham Seven driven by Tom Forsyth. 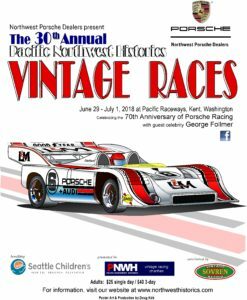 Tickets for the Pacific Northwest Historics are available old-school style, meaning at the gate only. Twenty-five bucks get a single-day adult ticket, but you may want more than a single day with this kind of smoking action on the agenda. Three-day entry passes are available for just $40 if you want to enjoy the whole weekend. Kids 7-16 get into one day at a time for $5.00, and children 6 and under get in for no charge. What’s the weather forecast for the three-day event? Who cares? Let’s go see the beautiful old cars and see if a race breaks out. Gildshire bets it will.